The Answer Centre was established as a Telephone Answering Service on 1st June 2000, and since then it has grown into one of the UK’s leading providers of Telephone Answering Services and Business Mailing Address Services. The Answer Centre has offices in Edinburgh city centre and in Wokingham town centre in Berkshire. The Answer Centre will provide you with a telephone number that you can either advertise or divert your existing number to. You do not need any additional equipment to start using our Call Handling Service and we can have you set up in minutes. Your virtual receptionist will answer calls in your company name and sound exactly like your own company receptionist. Your calls will only ever be answered by a small team of dedicated Virtual PAs who you will get to know by name. We believe that the only way to provide a fully personalised phone answering service is to have your calls answered by a small number of real people with real names who fully understand how your business works. If you are looking for a call centre you have come to the wrong web site! For only 35 pounds per month we can offer a Virtual Office and Mail Forwarding Service at either our Edinburgh city centre address or our Wokingham town centre address in Berkshire. Using a Virtual Address helps your business to create the right impression, and to generate an image of an established business with its own premises. Virtual offices provide a major cost saving when compared to traditional office space. Mail will be sorted by your Answer Centre Virtual Assistant and forwarded by first class post to an address specified by you. Alternatively if you are in our area, why not drop in to collect your mail and have a chat over a coffee. The Answer Centre has offices in Edinburgh city centre and in Wokingham town centre in Berkshire where you can hire meeting rooms to conduct your business meetings. Our impressive meeting rooms are competitively priced at only 25 pounds per hour. Whatever your requirements are for your meeting, just let our reception team know and we will make the necessary arrangements. The level of support provided by The Answer Centre means that you can focus fully on ensuring that your meeting goes to plan. Is your call handling service for small businesses? Our call handling service is for businesses of all size, regardless of the number of employees. Many of our customers are small businesses consisting of self-employed individuals like accountants, estate agents, IFAs and single tradesmen. Small businesses benefit greatly from the service as it helps to give the impression that they are larger and more established as well as ensuring that they never miss a call or a new business enquiry. Do you have a pay as you go call answering service? Yes. 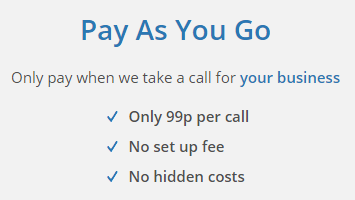 Our Pay As You Go call handling service is extremely good value for money at only 99p per call. With no set-up fees or hidden charges, you will get your very own PA who will answer calls in your company name. Callers can either be put through to you or we can take a detailed message which will be sent to you by email or text message. Do you offer a call handling service suitable for larger businesses? Yes. For larger organisations we provide an Virtual Receptionist and Call Overflow handling service which is suitable for organisations with hundreds of employees. We work seamlessly with your existing reception staff to ensure that all your calls are handled smoothly and correctly and that any calls or messages are put through to the correct person. Is your call answering service 24 hours per day? On our standard Pay As You Go call handling service tariff your PA will answer your calls from 8.30am to 6pm Monday to Friday. For a small additional charge, we can offer extended hours from 7am to 11pm seven days a week. How quickly can the telephone answering service be set up? Your service can quite literally be set up in minutes. 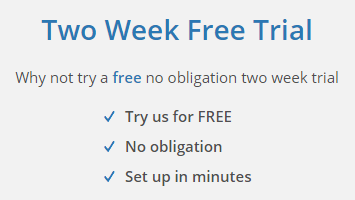 As soon as you sign up for the service we will call you to discuss your requirements and to take all the information that we need to handle your calls correctly. You will then receive an email confirming that the service is available for use and advising you of your new telephone number. You can either divert calls to this number or you can give it out to people directly and advertise it on your website, business cards etc. Do you offer call handling service for international businesses? Yes. Regardless of where you are in the world The Answer Centre can answer your calls and act as your company receptionist. Many of our customers live abroad but advertise a UK telephone number for their business. We handle all incoming calls and forward messages to you by email or text message regardless of where you are based. Can I get a phone number for any location in the UK? Yes. 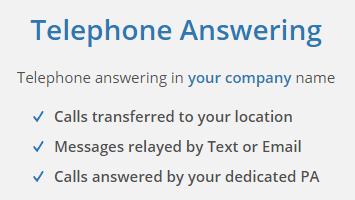 We offer any type of telephone number for any possible location either in the UK or international e.g. 01, 02, 03, 08, and international telephone numbers. Can I have my calls forwarded? Yes. When we set up your call answering service one of the options is to have callers put through to you on either your mobile phone or DDI number. Your Answer Centre PA will announce the name of the caller to you and give you the option of taking the call. If you are unable to take the call then we will take a message and forward that message to you by either email or text message. It?s just like having your very own receptionist sitting in your own office. I would like to take the opportunity of thanking you and your team for the excellent service you have provided over the past 9/10 months. I can no longer remember how many times I have recommended your services to others in our Industry who face similar congestion with being on site and trying to run an office. The Answer Centre offers a smooth and professional transfer and message service and we would recommend them to anyone looking for a similar type service.